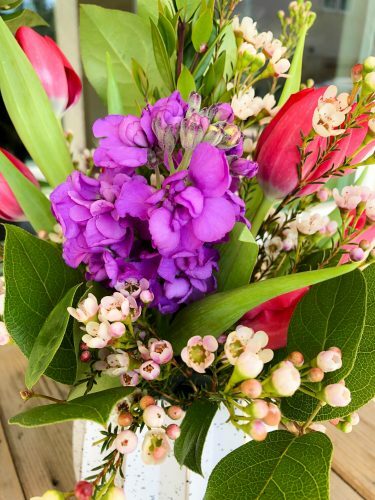 It’s a well-known fact that fresh flowers brighten moods. 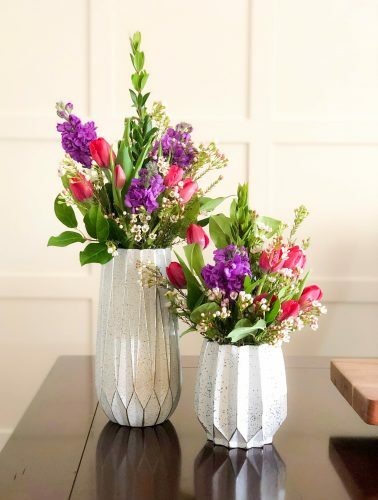 I once heard a famous wealthy woman say that the most important and meaningful part of her home was that she had fresh flowers around her house. I thought it was very interesting that she valued something from nature and easily available to us all the most. Not her imported marble tile, not her Persian rugs, but fresh, lively flowers! I completely agree with her… There’s just something about their beauty that cheers up a room, and there’s not much that can top it! I am always buying at least one fresh bunch of flowers when I make my weekly trip to the grocery store. 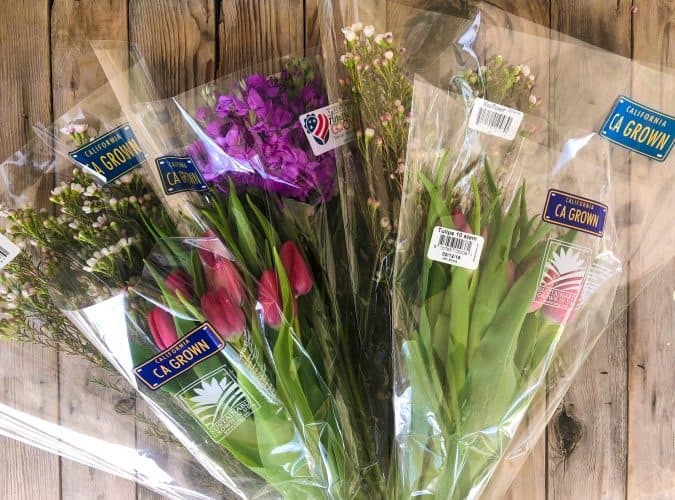 I am thankful that most stores carry California Grown flowers and that the selection is vast. Depending on the season, I just tailor my arrangments to what is available. Of course, I start with fresh, in-season California flowers. 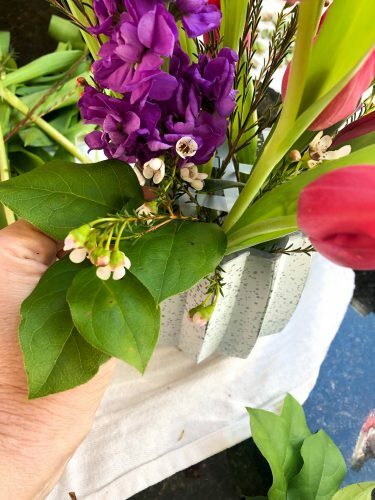 This week I bought beautiful fuschia tulips, aromatic purple stock, and sturdy waxflower. I begin by making my own preserve water. It’s super easy! Just add 2T. sugar and 2T. 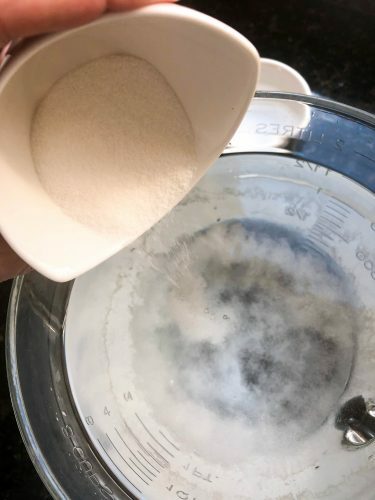 white vinegar to a quart of lukewarm water and stir to dissolve. This will help extend the life of the cut flowers. Fill the vase only half way with water. 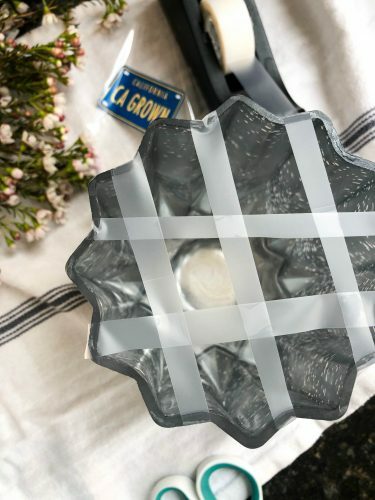 I always add strips of scotch tape to a wide-mouthed vase. 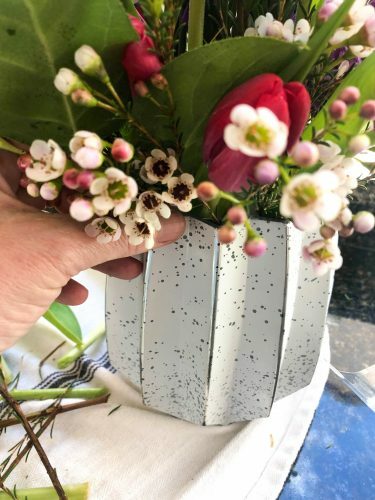 This helps prevent all the stems from falling to the outside of the vase and allows you to control the height of the arrangements and stand the stems up vertically. 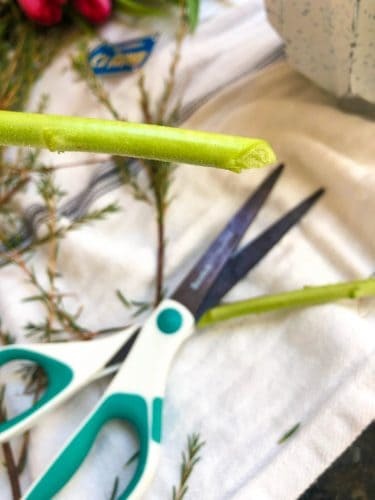 Before placing the stems in the water, you need to remove any leaves from the part that will be directly in the water. This helps prevent bacteria from forming in the water, which is the most common cause of fresh flowers dying and wilting prematurely. Cut all the fresh flower stems on the bias before placing n the water. The new cut helps the flower to take in more water and the bias gives the stem more surface area to take in that water. For this arrangement, I started with the waxflower. 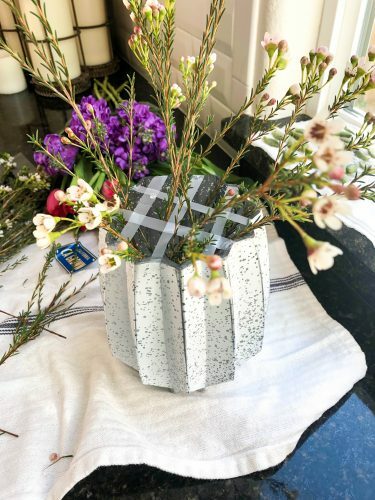 It’s a sturdy flower with a woody stem so the placement was easy to arrange. Keep the lengths of the stems varied so the arrangement has staggered heights. Don’t use all of it as we will be using this same flower for filler in the end. Use green filler to fill in all the blanks. You can usually buy a bundle of greenery, or you can just go out in your garden or yard and see what you have there! 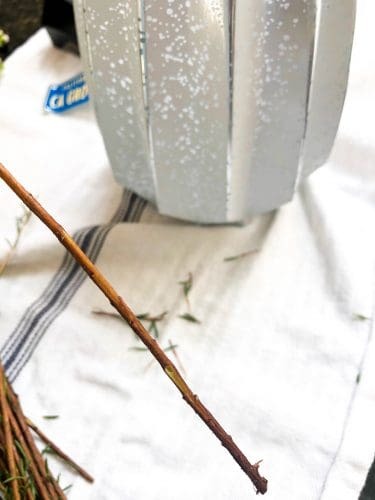 I used citrus and gardenia leaf stems for my filler. 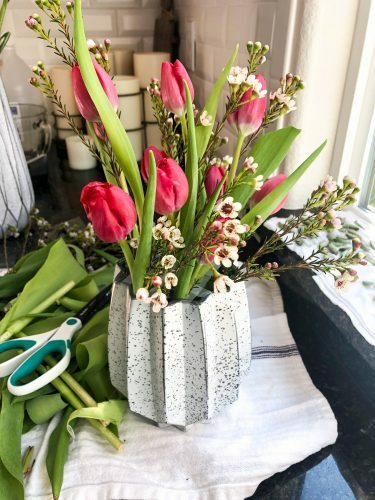 Your new arrangement should last at least a week in your home and possibly even longer. 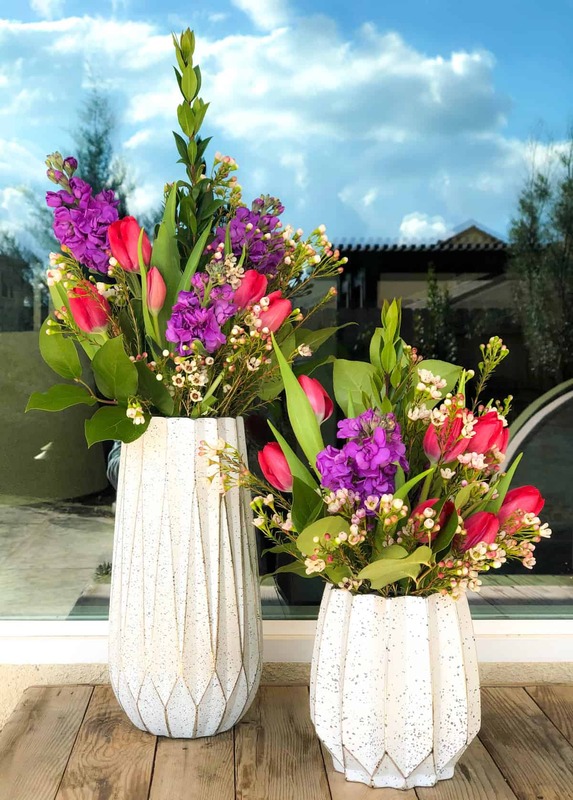 Remember to add a little more water to the vase daily to replenish what the stems are drinking up. 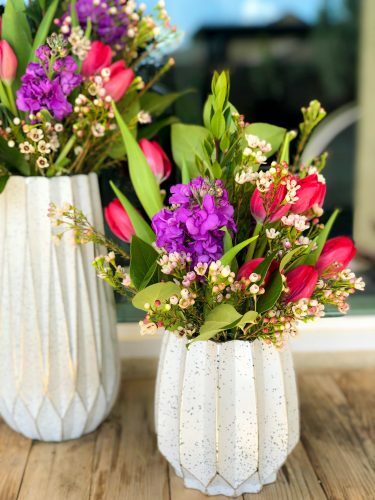 You’re very own floral arrangement! These are an easy, thoughtful, and economical gift for anyone on your Valentine’s list. 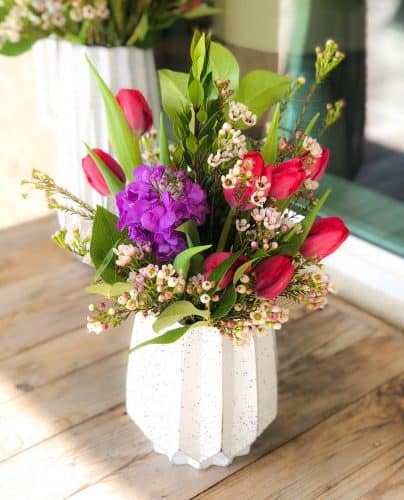 So, get out of the red roses rut for Valentine’s Day this year and make your own arrangement using California grown flowers!